An outdated school of thought is that visits to the dentist should only be made when you are experiencing pain or discomfort in the teeth and gums. This is problematic because a large amount of damage may have already occurred by the time symptoms begin to develop. Utilizing preventive care and correcting existing damage with restorative services can help you maintain optimum oral health, avoid the pain of complex dental treatments, and prevent irreversible damage. Thanks to current dental technology, including advanced imaging techniques, your dentist can detect problems at their earliest stages of development and help you prevent further damage before extensive treatment is necessary. Your dentist can also offer specific products that will keep your teeth in prime condition. Dental sealants are an effective way to block tooth decay, and protective mouth guards can save active individuals from painful and expensive injuries. Gum treatment is also an essential part of preventive care; periodontal disease is an incredibly common problem among Americans, but it is highly treatable when identified early. How Does Cosmetic Dentistry Contribute to Comprehensive Care? In spite of the name, cosmetic dentistry actually does as much for the health of your teeth and gums as it does for their appearance. Repairing imperfections in the teeth preserves the integrity of the bite, which reduces the chances of injury, tooth loss, and decay. Investing in restorative treatment can help patients stay motivated to care for their teeth and continue healthy habits. The office of Dr. John Carson, D.D.S. is dedicated to providing all the necessary services to keep your mouth healthy through quick and efficient office visits. Our Tucson facilities feature cutting-edge technology that makes personalized treatment a possibility for every patient. Schedule a consultation to see the difference we can make in your oral health by visiting our website or calling (520) 514-7203. Traditional dental crowns require several office visits to shape, customize, and implant. Cerec technology eliminates the need for multiple trips to the dentist’s office and produces the same results as traditional crowns. This video shows Cerec technology in action. In just moments, this machine takes a digital impression of the patient’s tooth and creates a crown that fits in every dimension of the mouth. Patients don’t have to worry about wearing a temporary crown or having messy impressions made. Dr. John R. Carson, DDS offers Cerec crowns in addition to all the latest dental care technology. Call us at (520) 514-7203 to schedule your next dental appointment. 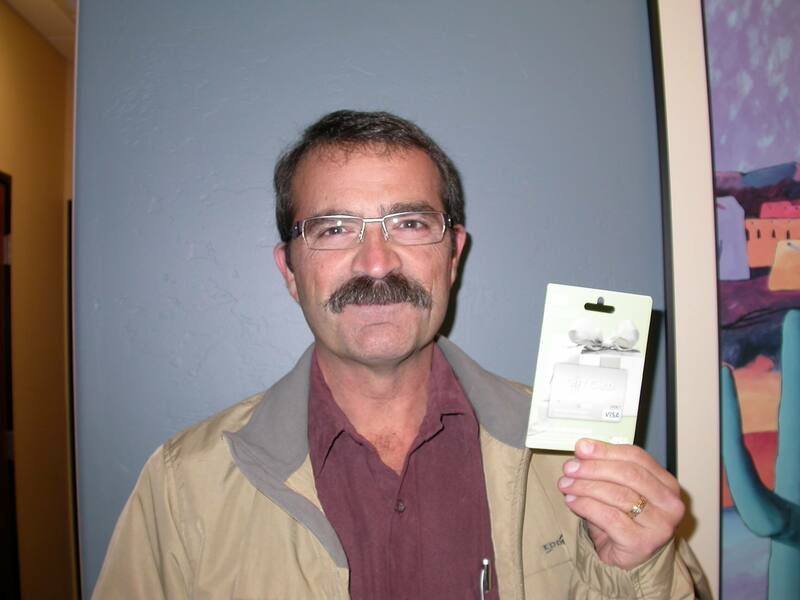 Congratulations Michael C. our November $100 Winner! Thank You for being a loyal hygiene club member! Ask Belinda for more details. Instantly available images: Without the need to develop film images, your dentist can take X-rays and review them with you immediately. Using a computer screen, the images are easily enhanced, enlarged, and stored to streamline your dentist visits. The image quality is higher than that of film and the images can instantly be shared between computers and sent to specialists. Lower doses of radiation: Digital radiography is a safe diagnostic procedure because it produces only a fraction of the radiation of film X-rays. Plus, the images can be touched up after they are taken so the necessity to retake X-rays is fairly low. Better patient understanding of oral hygiene: Using the advanced images of digital X-rays coupled with the live imaging of intraoral cameras, your dentist can explain the necessity for certain dental treatments while showing you the extent of damage. While X-rays show the teeth below the gums, intraoral cameras show patients the outer surfaces of the teeth and gums on a high-resolution screen. If you would like to experience the benefits of high-tech digital radiography, then schedule an appointment with Dr. John Carson, DDS at (520) 514-7203. Our office provides preventative, cosmetic, and restorative services using the latest in dental technology, including digital X-rays and intraoral cameras. Your dentist can help you smile beautifully for life by correcting existing damage to your teeth and helping you practice good habits to preserve your oral health. Dr. John R. Carson, DDS offers Tucson residents complete dental services, including root canals, dental implants, and gum disease treatment. Learn more online or call our offices at (520) 514-7203. For facts about dental X-rays, visit Colgate.com. Check out WebMD.com to understand when root canals are appropriate. See the anatomy of the tooth at the National Institutes of Health’s encyclopedia. Review the dangers of tooth decay with this article from the ADA. Each tooth in your mouth contains sensitive nerve tissue called pulp. When the exterior of the tooth is damaged, the pulp may become infected, causing extreme pain and sensitivity. When a root canal is performed, a dentist can save the body of the tooth and eliminate discomfort by extracting the pulp and sealing the tooth. Because the pulp is only present for sensory function like detecting temperature or pain, the tooth can function without that tissue present. What Causes Damage to Teeth? The teeth are protected by strong enamel that can wear away over time in a process known as tooth decay. Once the enamel is penetrated, bacteria can work through the dentin into the pulp, causing it to become infected. The pulp may also become exposed as a result of an oral injury that cracks or fractures the tooth. Repeated dental work and large fillings are other opportunities for bacteria to thrive inside the teeth. How Can Root Canals Be Prevented? Patterns of consistently good dental hygiene, including regular brushing, flossing, and visits to the dentist, are important to preventing tooth decay and damage. However, unanticipated injuries that compromise the health of your teeth can occur. Once a tooth is damaged, it is best treated as soon as possible. A root canal is a safe and effective treatment, and it allows you to retain the structure of your tooth. Without treatment, an abscess may form, causing extensive damage to the jaw, soft gum tissues, and facial appearance. If the tooth is sensitive, discolored, or sore, then your dentist may advise a root canal. To restore your dental health, contact the offices of Dr. John R. Carson, DDS. We provide comprehensive dental care to Tucson residents with services including root canals, crowns, porcelain veneers, and tooth whitening. Schedule a consultation on our website or call us at (520) 514-7203.